Fox Plumbing & Heating is your one stop for both plumbing and HVAC services in Seattle. Whether you need annual maintenance for your heating equipment, or emergency repair service for gas or electric furnaces, heat pumps, AC units and more - contact us today! WHAT IS THE DIFFERENCE BETWEEN MAINTENANCE AND REPAIR SERVICES? While both a maintenance appointment and a repair appointment are considered “service”, there are some differences to understand when requesting an HVAC service appointment. HVAC Maintenance: An annual tune-up for your heating or cooling system is recommended by Fox any your manufacturer. The tune-up includes cleaning, calibrating and testing of equipment to ensure it is in good working order. A tune-up will prolong the life of equipment and your investment. An HVAC maintenance appointment may include replacement of worn parts, but it is not a diagnostic appointment to fix issues and is not what you need if your equipment stops working. HVAC Repair: Our Heating & Cooling Specialist will diagnose the issues with the HVAC equipment. Then provide repair estimates and most often, do the work right then and there. Occasionally parts need to be ordered and a follow-up visit arranged. This type of appointment is what you need when your HVAC equipment stops working, exhibits loud noises or other problems. You can call a Fox HVAC Specialist 24/7 for diagnostic or emergency service. In general, a maintenance appointment has a flat rate charged, and a diagnostic repair appointment cost will vary depending on the repair required. WHY CHOOSE FOX FOR YOUR HVAC SERVICE? 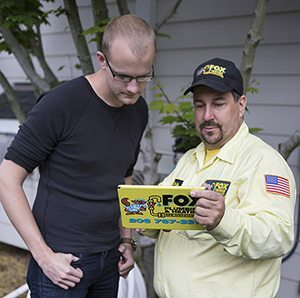 With over 50 years of service experience, Fox’s Heating & Cooling team has seen and done it all, and we’re available 24/7 to address all of your HVAC maintenance and repair needs. Check our service map and call Fox Plumbing & Heating to schedule your next heating or air conditioning service appointment today. Or fill out the contact form on the right side of this page, and we’ll call you!